Readers of this blog know all too well my thoughts on the Runt Radials manufacturers attempt to tell us work just fine despite a century of work suggesting otherwise. A Zed Thread highlighted problems a user was having with his Comet CP-3. Later discussion suggests the GP-3 had other problems, but not before we discussed the possible culprit of the ridiculous short radials for proper 2m operation. Testing was the next step. Similar to the Comet GP-3, the Diamond Antenna X50NA is an almost identical competitive product and I just happen to have one on hand to test. I also had radials handy from a Diamond Antenna CP22E 2m monobander that conveniently thread in place of the X50’s stock 7 inch rods. With this assortment of stuff and placing it all upon a 6 foot conductive speaker stand, I could test the X50 and examine the utility of radials. With no radials, impedance changes for both 2m and 440 were easily observable with varying hand positions. With seven inch radials, impedance changes for 440 were almost entirely eliminated. 2m impedance changes continued. With 20 inch radials, impedance changes for both 440 and 2m were almost entirely eliminated despite hand positions. This suggests radials of 1/4 and 3/4 wavelength do a good job of immunizing the antenna from circumstances that might encourage rf currents down the mast or coax. Radials of 1/12 wavelength do nothing. The above graph represents the worst case we could see with a ferrite at a certain position. The mast of course has a role in unwanted currents as well. 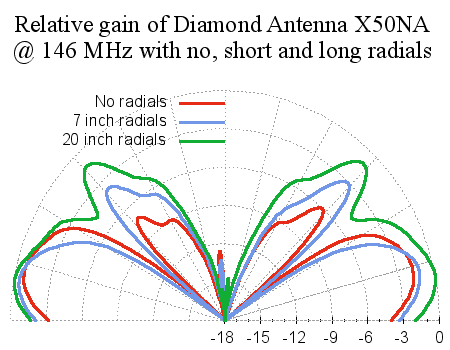 The best case is where the radials are 1/4 wavelength, or thereabouts, at 146 MHz. Without the ferrite, we still see some reduction in antenna performance, but much less severe suggesting a circumstance where chance presents a high impedance from mast/feed-shield to the feedpoint. Positioning the ferrite encouraged a worst case scenario to help us examine how well radials prevent this scenario from playing out. 7 inch radials don’t do much at 146 MHz. 20 inch radials do a lot for us at 146 MHz. There are plenty of installation cases where the mast or feedline circumstances do not try to steal gobs of current from your coax feed point therefore reducing the need for the radials, but this appears to be simply about luck. From our ferrite and hand placement experiments, I would think most folks might have significant rf currents down the mast/feed, say, 1/6 to 1/12 of the time. Roll a 6 on one die or snake-eyes on 2. Good odds. In our example, we only lost a dB or two due to currents on our mast/feed. No big deal to some, but… why did you spend $100 on an antenna? Among other things, a little more gain? If so, why accept a little more loss due to ineffective radials? In our example, the mast/feed is about 6 feet long. What happens when this changes to 20, 30, 40, etc. should be concerning… not good. Mounting circumstances favor the user with regard to how much current might flow down the mast/feed. Still I want my investment to pay me back with the promised gain in “all” circumstances. 1/4 wave radials have ensured this is possible for, what, one hundred years or so? If the Comet GP-3 is anything like the X50, and I think they are practically identical in overall dimension and design, their lust to shave a few bucks off cost with short radials remains a stunner. It is curious to note this lack of attention to proper radial length seems unique to only amateur radio products. In every other way the products and designs from Diamond Antenna and Comet appear to be top notch. So odd. a good ground radials always pays good result.